STREAM Automated Waste Collection Systems (AWCS), also known as a “Pneumatic Waste Conveying System” transports municipal or domestic solid waste through underground pipes at a high speed from the waste chutes and outdoor load stations into a sealed container located up to 2.5km away. The full container is then collected at specific times by a flatbed armroll truck. Our system dramatically speeds up the whole garbage collection process whilst reducing manpower requirements. In addition, we can see the differences as compared to conventional waste collection methods, such as frequent removal of waste to avoid the stench of rotting garbage, improving security levels with reduced labour and trucks accessibility, and preventing fire hazards and vermin from getting access to the garbage. Automated Waste Collection Systems (AWCS) also addresses two major problems currently faced by the authorities in managing the waste collection and management. Firstly; irregular collection schedules due to the high number of separate collection points coupled with the often delay due to road congestion and secondly; leachate spillage onto the streets caused by conventional rear loader garbage trucks not being adequately sealed. Through the use of the STREAM Automated Waste Collection Systems (AWCS), developers (during the planning stage of a new development) are able to strategically locate the Central Waste Handling Facility (CWHF), to prevent garbage trucks having to access their development areas to collect garbage. The STREAM container is completely sealed, thus guaranteeing that no leachate spillage occurs during loading and transportation to the transfer station. Whilst most utilities such as water, sewerage, gas and power have evolved to become underground infrastructure over time, the way waste is handled is still fairly ancient and continues to use the “bucket” system. The STREAM Automated Waste Collection Systems (AWCS) is also capable of being applied in the same manner as modern utilities to serve a large development, with the waste being transported to a collection centre up to 2.5km away. STREAM Filter System removes fine particles and odour before it is emitted to the environment. 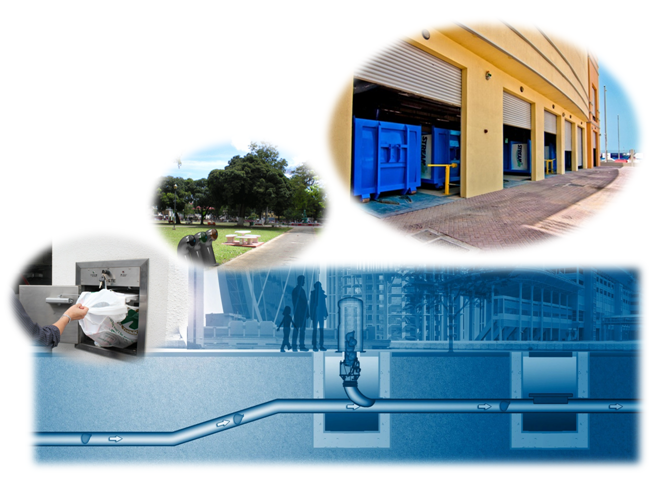 Our system has the ability to transport and store various types of waste separately through a single pipe. We have the Gravity System and Full Vacuum System, which were designed to suit individual development needs.